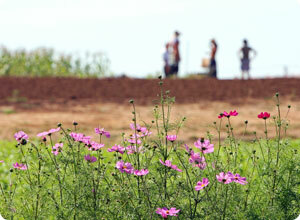 Visitors to the Farm can take a self-guided tour. The Arboretum holds a rich collection of plants from around the world. With its long, sunny days, the summer season is a good time of year to explore UCSC and its off-campus facilities. Whether you want to see a play, tour the campus, or learn about exotic plants, astronomy, or marine mammals, UCSC offers the opportunity. Admission is free, unless otherwise noted. Shakespeare Santa Cruz's 2009 offerings from the Bard are A Midsummer Night's Dream and Julius Caesar. Also on offer is the family friendly Shipwrecked! An Entertainment--The Amazing Adventures of Louis de Rougement (As Told by Himself), written by Donald Margulies. Shakespeare Santa Cruz is a professional repertory company in residence at UCSC. The campus's Shakespeare festival was founded in 1981 and continues to be held annually each summer on campus. Plays are held indoors on the UCSC Theatre Arts Mainstage and outdoors among the redwoods in the Festival Glen. Bringing in professional actors, directors, and designers from throughout the country, the company's season runs from mid-July through August and features three to four plays presented in repertory. The campus is also home to the Dickens Universe. Held every year at the beginning of August, the Dickens Universe brings together scholars, graduate students, high school teachers, and members of the general public for a week of study and Dickensian conviviality. The program includes formal lectures by internationally distinguished scholars, seminars, small discussion groups, films, performances, exhibits, and a variety of informal social activities. Regularly attended by more than 200 participants of different ages and backgrounds, the Universe provides a relaxed and supportive environment in which to pursue serious intellectual inquiry. Each summer, the Universe program focuses on a different Dickens novel and on a related theme. Previous gatherings have featured such topics as "Dickens and America" (in conjunction with Martin Chuzzlewit), "Dickens and Women" (in conjunction with Dombey and Son), "Dickens and the Law" (in conjunction with Bleak House), and "Dickens and Victorian Publishing" (in conjunction with The Pickwick Papers). Papers presented at the Dickens Universe are published regularly in Dickens Studies Annual: Essays on Victorian Fiction. Dates for the 2009 Dickens Universe, featuring David Copperfield, are Sunday, August 2, to Saturday, August 8. By purchasing a recreation/wellness card or paying a day-use fee, members of the community gain access to UCSC's recreation facilities, which include tennis, racquetball, and basketball courts; wellness center; running track; and playing fields. (The swimming pool is closed for renovation through September 3 or later.) For information, call (831) 459-2531. The McHenry and Science & Engineering Libraries house nearly 1.5 million books, nearly 17,000 periodical titles, 825,000 microforms, and 500,000 nonprint items, including maps, slides, and audio and video recordings. Most of these resources are available to the public; borrowing privileges are available through membership in the Friends of the UCSC Library or Alumni Association. Special Collections at McHenry Library contains rare, valuable, and often fragile materials that do not circulate but can be viewed by appointment. Science & Engineering: 9 a.m. to 5 p.m. Monday through Friday. Both are closed on weekends. Visitors to the UCSC Arboretum can stroll through its 40 acres of gardens, go on a First Saturday Tour, or learn about plants on a self-guided Hummingbird or World Tour. General admission is $5 for adults and $2 for children (6-17 years old), and free under 6; for more detailed admission information, visit the web site or call (831) 427-2998. A research and teaching facility, the Arboretum is open year-round from 9 a.m. to 5 p.m. daily, except on Thanksgiving and Christmas. Norrie's--a gift shop selling plants, cut flowers, wreaths, and books--is open every day from 10 a.m. to 4 p.m., except Thanksgiving and between Christmas and New Year's Day. The Jean and Bill Lane Horticultural Library, a nonlending library of horticultural and botanical books, is usually open Wednesday through Sunday from noon to 3 p.m. 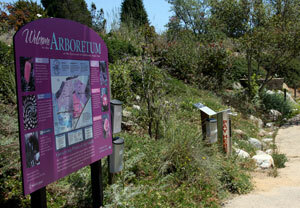 The Arboretum is located on Empire Grade between the campus's main and west entrances. Beginning in early June and continuing into the fall, the Center for Agroecology sells organically grown produce and fresh flowers each Tuesday and Friday from noon to 6 p.m. in front of the Barn Theater at the intersection of Bay and High Streets. The center also sponsors a number of classes and events, including pruning workshops, poetry readings, and a harvest festival. Aquarium and exhibits feature the everyday tools of ocean exploration and focus on research conducted by scientists on site and around the world. Skillful docents answer questions and lead tours beginning at 1 p.m. every day. The Seymour Center is open year-round, Tuesday through Saturday, 10 a.m. to 5 p.m. and Sunday, noon to 5 p.m.; admission is $6 for adults, $4 for students and senior citizens (64+), and $4 for children 4-16. Call for special summer hours. The Seymour Center is located at the west end of Delaware Avenue in Santa Cruz. For more information call (831) 459-3800 or visit the web site. The public is invited to view exhibits in the main observatory building, built in 1888. Enjoy an informal talk about Lick history while taking a look at the Great Lick Refractor in the 36-inch telescope dome. These talks begin at the gift shop, on each half hour starting at 1 p.m. on weekdays and 10:30 a.m. on weekends, continuing until 4:30 p.m. Each talk is about 15 minutes long. The visitors' center is open from 12:30 to 5 p.m. weekdays and from 10 a.m. to 5 p.m. on weekends, except for Thanksgiving, Christmas Eve, and Christmas Day.